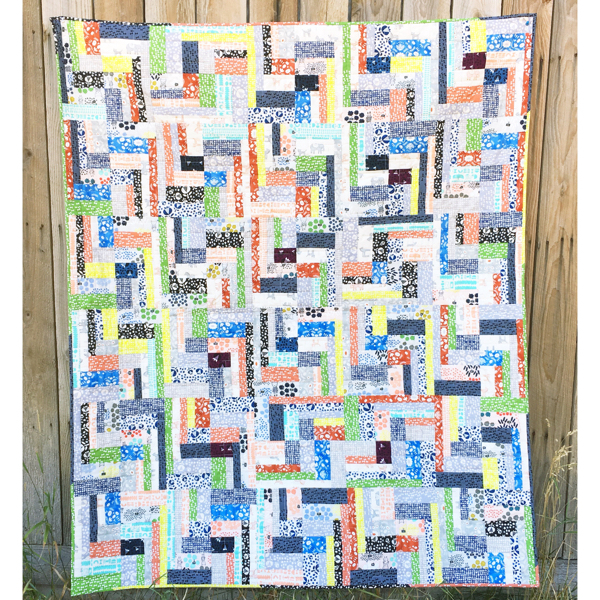 Just in time for the Quiltcon deadline, I finished my Hyperspeed quilt for entry! 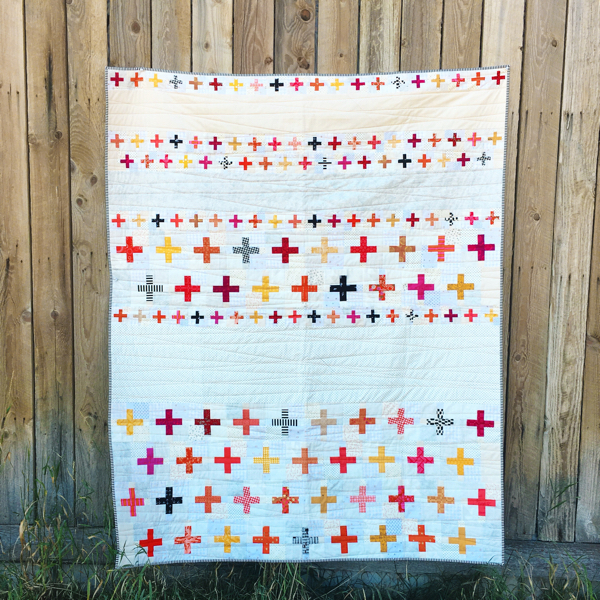 I designed Hyperspeed in response to the All People Quilt – Nine-Patch Challenge, for whatever reason a challenge always put my brain on alert for the perfect idea. 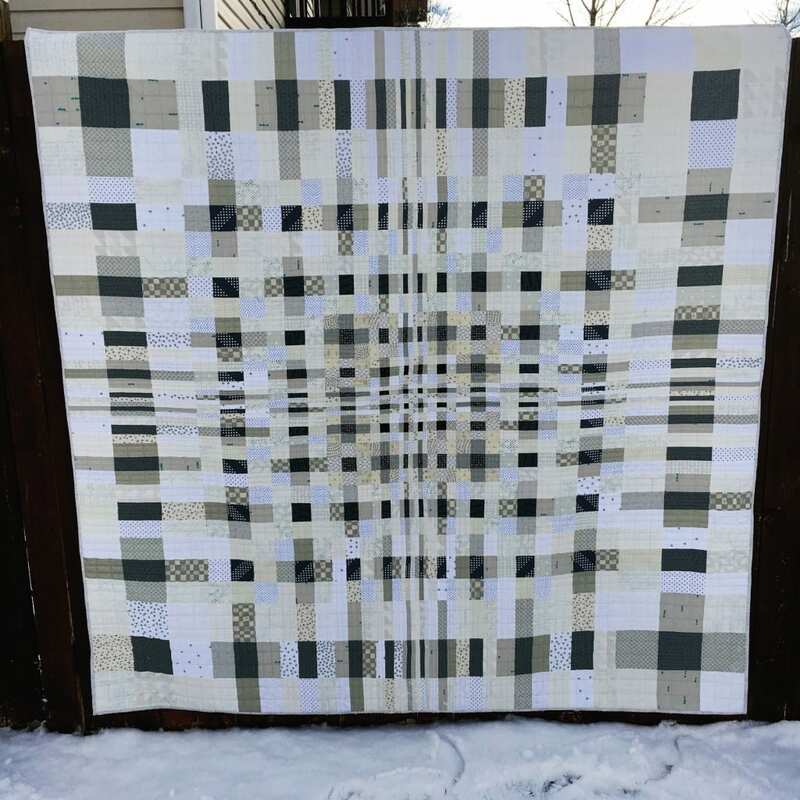 As I was finishing the binding, I was dreaming of the ideal photo for this quilt, and thankfully the weather and my family cooperated! 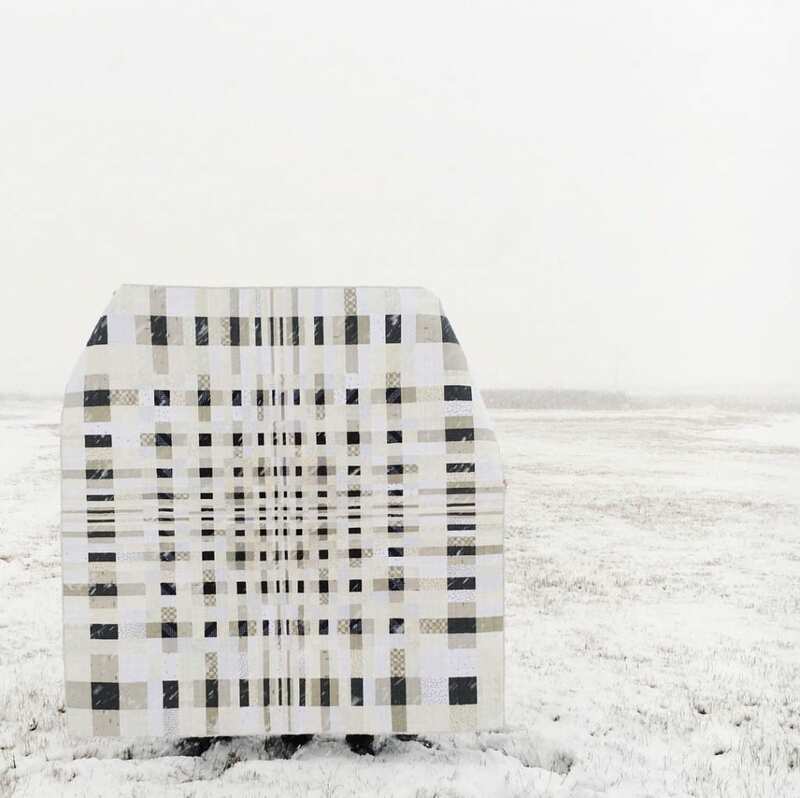 Having the snow to obscure the view and showcase the quilt was just what I was hoping for. 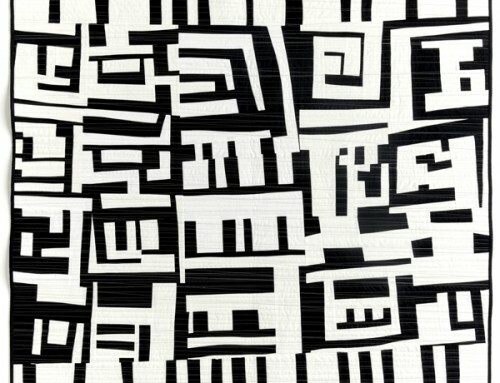 I had designed Placid Curves for my Modern Neutrals book, and loved the movement made with the squares and rectangles. After quite a few steps in EQ7 I had a nine-patch design that I loved and really wanted to make for the challenge. That was in September, and I shared a little bit of my progress here, thankfully I was eager to work on it, since a couple deadlines came and went in the midst of making this one! 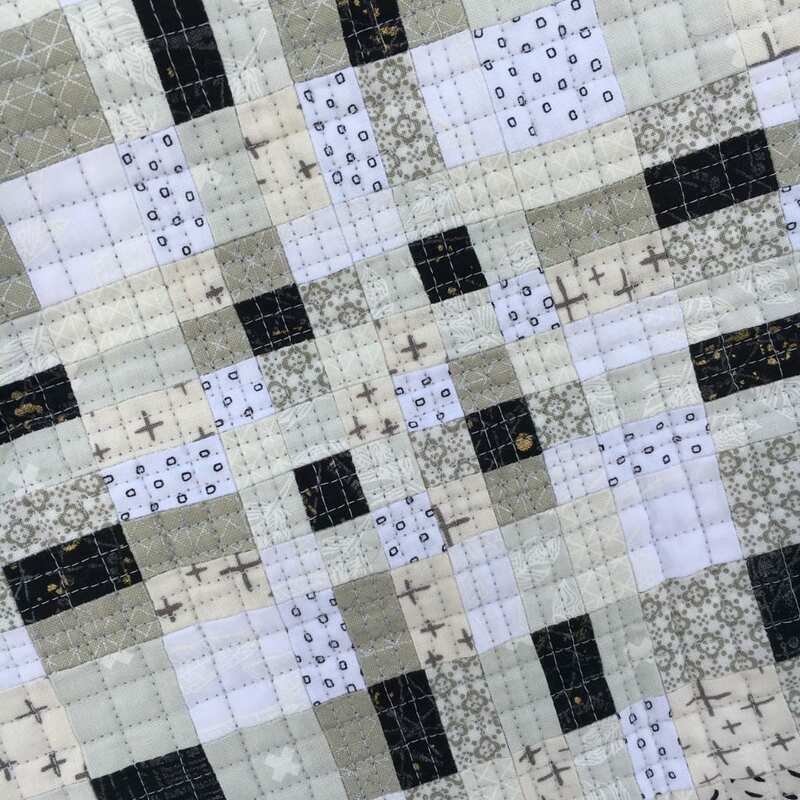 Quilting detail – I quilted a nine-patch over each square or rectangle in the quilt. Some of them are wide like this, but in the center they are very close together. 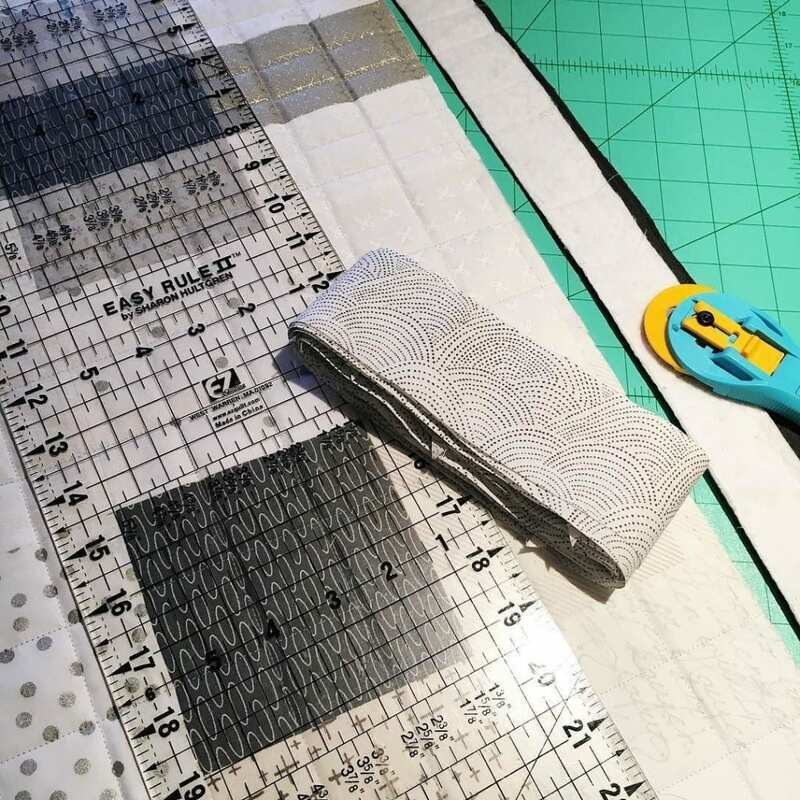 The center blocks measure 1 1/2″ x 1 1/2″ so each little square is 1/2″ finished. 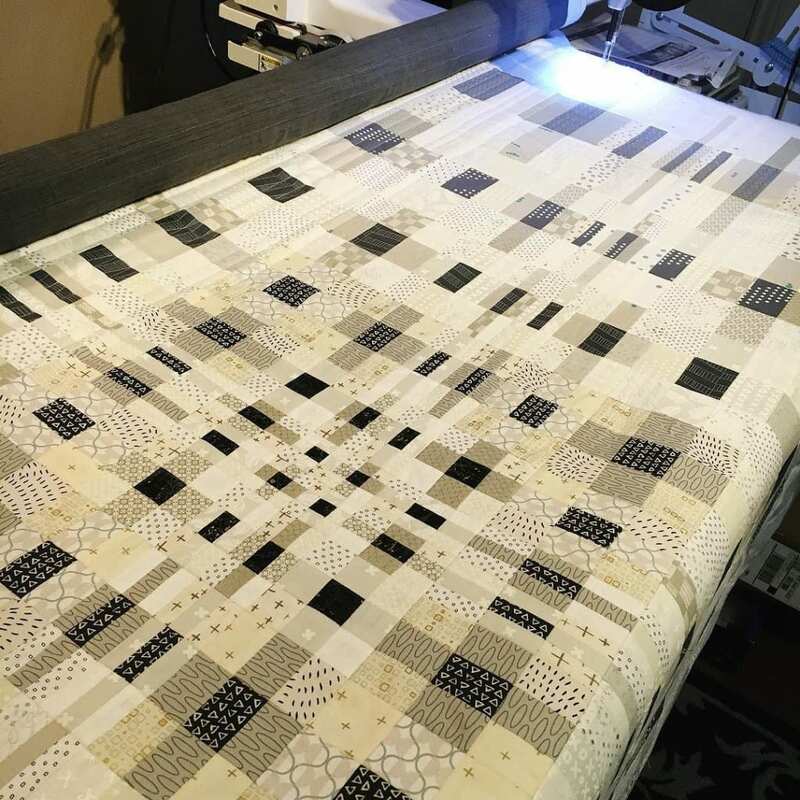 To quilt in both directions on the long arm, I first quilted in one direction, removed the quilt and trimmed the edges a bit, then reloaded the quilt to quilt in the other direction. This was a first for me, and a good challenge! To finish the quilt, I wanted the binding to blend into the background. This Dear Stella print had just enough grey, and the tiny print made it a perfect choice. 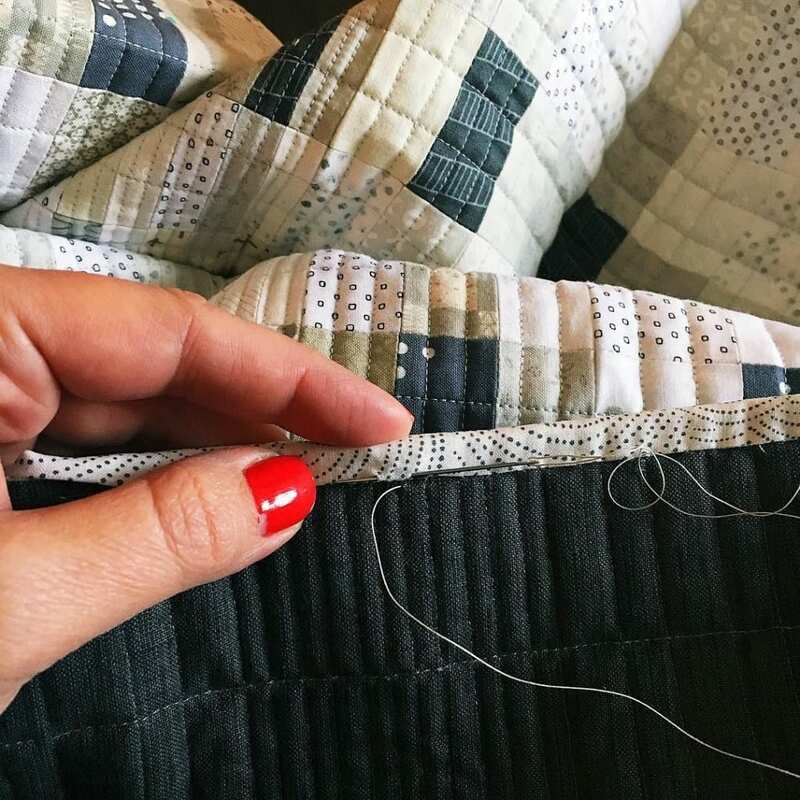 I backed the quilt with Moda CrossWeave in black, making it very soft and comfy for binding time. 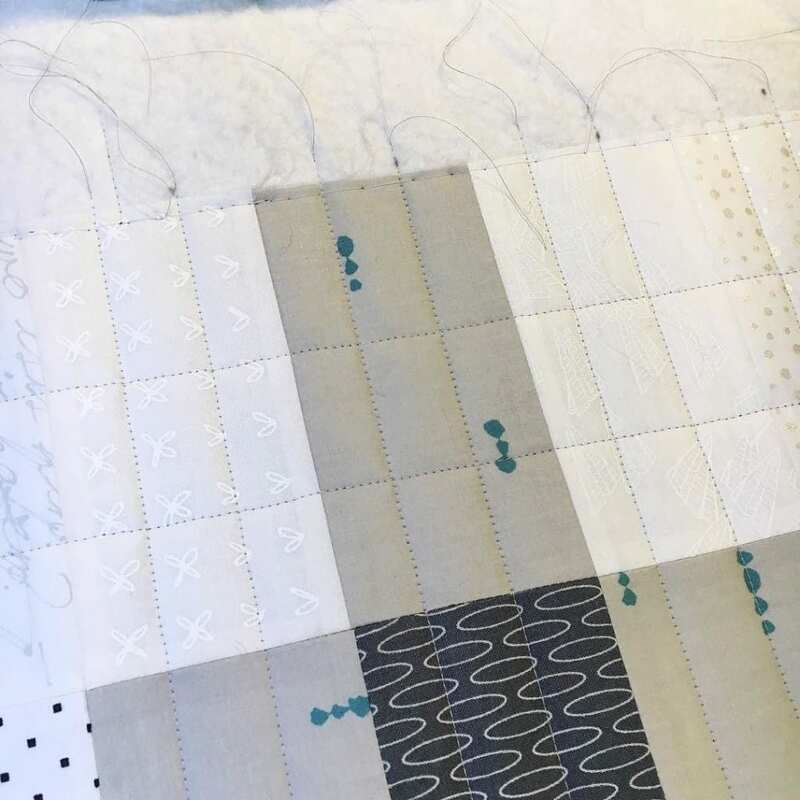 I purposefully used a variety of prints in similar tones, to add interest, and movement in the quilt top. 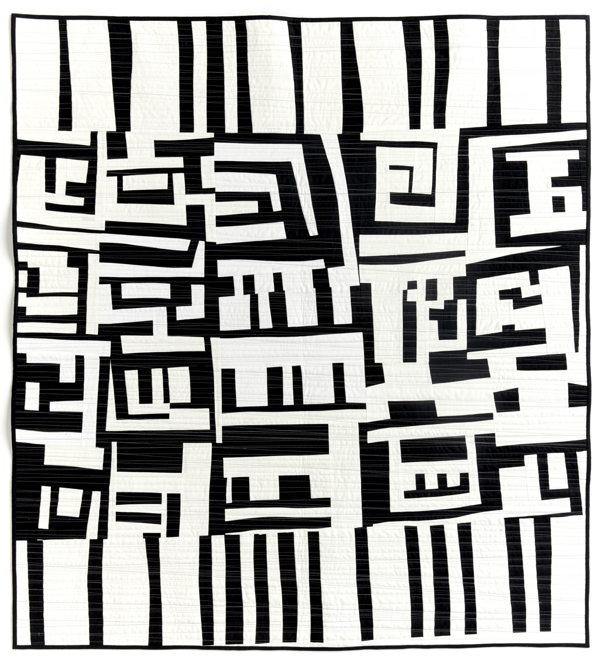 In this photo you can see that the center of the 9-patches are the same in each round radiating out from the center, with the deepest tone in the center of the quilt. One more shot without the snow. 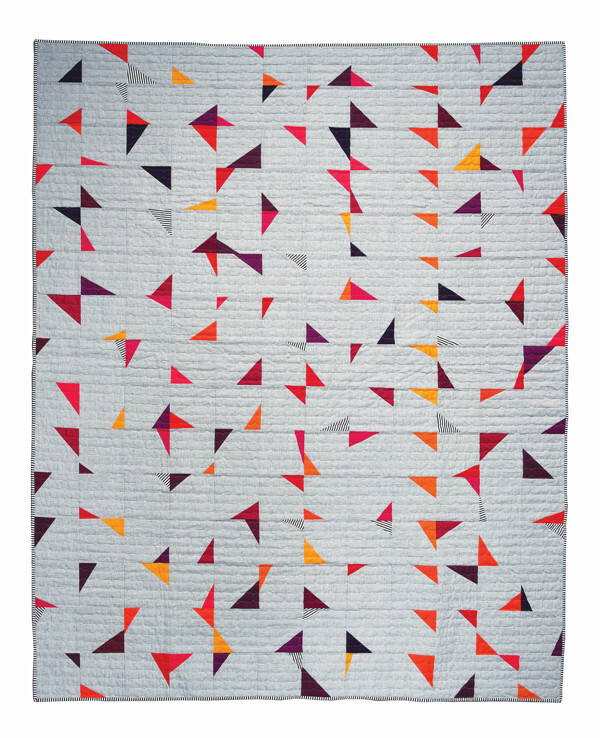 I love the full effect, hopefully Hyperspeed will be hanging at Quiltcon in a few months – I’ll keep you updated as I know more It will definitely be hanging at Quiltcon, just got my acceptance email! 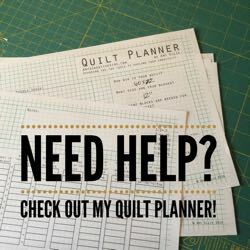 I’m working on a pattern for Hyperspeed so you can make your own, be sure to add you are signed up for my emails to be notified when it’s ready. Amy, this looks amazing. Love your take on the nine patch challenge. What a terrific design! It sounds like you finished it up at hyperspeed, too. I absolutely love this. 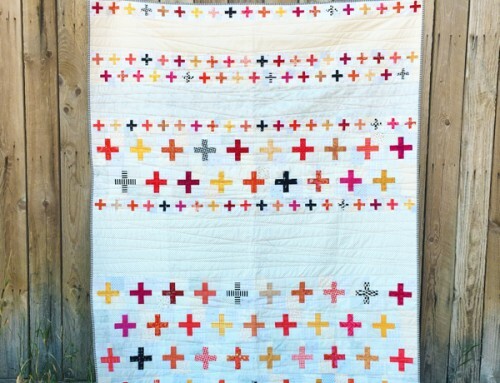 Definitely one of my favorite quilts of 2016!!! I love the tonal values and the movement. Great choice on that binding fabric too! Amy love your quilt. 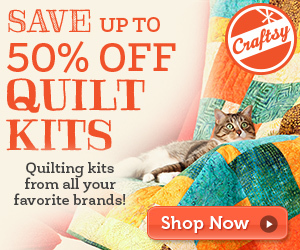 May be just the ticket for a quilt for my sister. Love this, Amy! Can’t wait to see it in Savannah! Great design and beautiful execution! 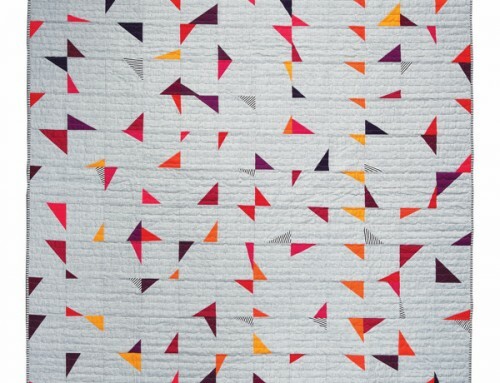 I especially like the nine patch quilting. 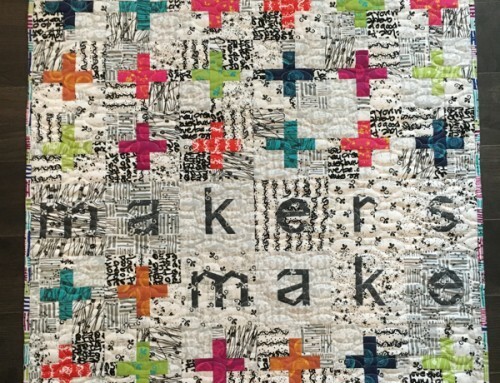 Congratulations on the acceptance to QuiltCon. I can’t wait to examine it in person! I’m really excited I found this. 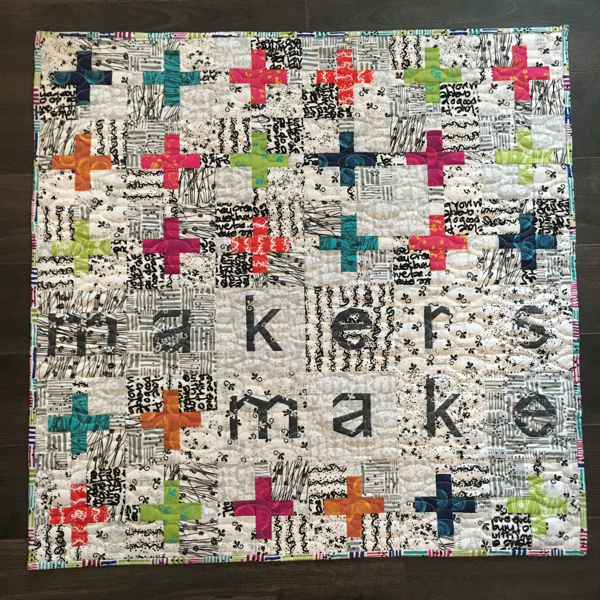 I’m taking your class at Quiltcon 2018. 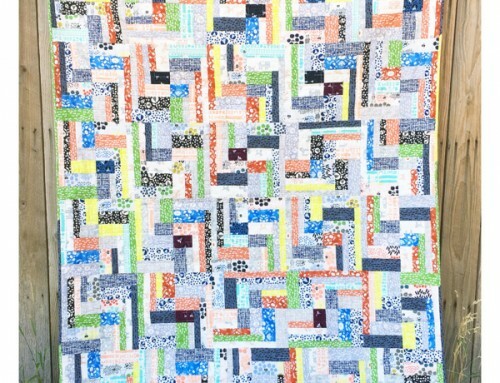 I can’t wait to meet you and see your gorgeous quilt.